Waitaminnit! There’s a movie series I have never heard of? During the 1930s and 1940s, before the advent of television becoming an integral part of American households, movie series were not multi-million dollar extravaganzas. They were the counterparts of what television would come to offer: continuing characters a viewer could come back to time and again. In the case of films, the audience may have been coming to see the big screen movie, but those second series features often drew audiences, as did the cartoons. These characters depended on the audience going out to the theaters and paying cold cash money to see them. I don’t recall Warners having many actual series during those decades, but now, with Warner Archive Collections, Warner is releasing many of the film series from 20th Century Fox, MGM and Allied Artists. Pristine complete prints come with these series, from Andy Hardy, The Falcon, Tim Holt westerns, Red Skelton’s Whistling mystery comedies, and many others film series. I never knew Wild Bill Elliott did a police procedural series for Allied Artists during the late 1950s. Wild Bill was a peaceable man, which he would tell you in many Westerns — just before he slugged you senseless. Wild Bill wore often wore his guns backwards in their holsters, as Guy Madison did in the early 1950s television series Wild Bill Hickok. I get the impression that if your name was Bill you were naturally nicknamed Wild, and you wore guns backwards, which really looked pretty cool, if not practical. Warner Archive Collection has preserved the five Bill Elliot Detective Mysteries (which I never knew existed) in sharp clear, black and white, widescreen prints. The company is doing an impeccable job of preserving these small films that might have been lost forever. Elliott was one of those actors who decided against trying for his own television series, or guest-starring on other people’s shows, and worked off the remainder of his film contract doing these hour-long (sometimes a bit longer) series of films, as Lt. Andy Flynn, who becomes Lt. Andy Doyle with the second film. Someone had not checked too thoroughly on the name beforehand, thus Andy changed his last name, but he remained the same unperturbed guy, hunting down miscreants without breaking a sweat. Dial Red O has Wild Bill tracking down a war veteran who is suffering from PTSD — not titled or acronymed in the time frame this movie was made, but a topic that had invaded movies since the end of World War II. This is the toughest feature in the series, with many locations that later budgets do not accommodate, that spends as much time with the haunted vet as it does with Bill Elliott. The vet’s wife has been found beaten and strangled, and he goes on the lam. The sequence where the wife is murdered is the most brutal violence in the series. Some of you are asking by now what in the hell the title of this piece has to do with these police procedurals. You may be thinking: Don suckered us in here, but I don’t see hide nor hare of Sam Peckinpah. The manhunt takes characters to a Nay’s burger stand that I wish I could stop by today. It’s picturesque and unique, and hopefully a few of these places still exist. Who should be dishing out the dialogue and the fast food intake? According to Richard Harland Smith‘s MovieMorlocks.com column, Sam was working for Allied Artists as a dialogue director. A little more than a year or two later, Sam was developing and writing the first episodes of The Rifleman, the show that Arnold Laven created. Sam being Sam, it was a short-lived combo, with Sam wanting the series to focus on the grim realities of life in the midst of a harsh, and oftentimes, unforgiving environment. Robert Culp appeared in two of Rifleman episodes, showcasing in one of them, The Man From Salinas, his beautiful, balletic grace with a six-gun, with twirls, flips, over shoulder rolls, etc. It has been stated that Bob and Sammy Davis, Jr. were the fastest guns in Hollywood at that time. Later Bob would write a two-part Rifleman titled Waste. Sam Peckinpah, who was a close friend with Bob, told him he was never to write for the series again. Sam was a writer taking to the grave the mismanagement he felt Laven had done with the show. And I suppose that Sam saw Waste and realized Culp as a storyteller was capturing exactly what he had been fighting about as the tone and reality of the series. Quite honestly, if it were me, I suspect I would not have been thrilled with anyone, Peckinpah or anybody else, telling me where or what I could write. But who knows? It’s only when the reality is there that you know what you really would do. A young Jack Kruschen living a science fiction writer’s cluttered life, alone with his toys, artifacts, imagination and fantasies is one of the misfits Wild Bill interrogates without much trace of emotion. Wild Bill doesn’t even comment that Jack almost looks as if he is dressed in drag. With a pipe. The second film, Sudden Danger, in the series dwells on a blind man who Andy Doyle (renamed because there was a real Andy Flynn on the police force) investigates as possibly murdering his mother to obtain money for surgery that might cure his blindness. Beverly Garland is on hand as the girlfriend who believes in the blind man. The only comment I can make here is, if anyone was in doubt, the director, the writer, the film editor, when in doubt go to Beverly. Beverly played a woman pirate, Coco LaSalle, in a couple of episodes of Yancy Derringer, opposite Jock Mahoney. I wrote about that series in an earlier Riding Shotgun you can find here. I tried like hell to find a photo of Beverly as Coco for this piece, but if any exist, I could not find them. So, here, just to visually illustrate my above comment, about going to Beverly when in doubt, is a photo from one of her films. Calling Homicide begins with a blast, as one of Wild Bill’s co-workers is blown up in the Hollywood police station parking lot. The films utilize a first person narrative for Andy Doyle now that bridges sequences. Abruptly after the car explosion, patrol car cops find a body up in the California hills, lying face down in the muck as rain slashes the murder scene. Her face has been bashed in. Someone doesn’t want her recognized. It doesn’t take Wild Bill long to learn she was a model, and her death is quite possibly connected to the death of his investigative colleague. James Best is a part of Andy Doyle’s squad this time around, though he isn’t given much to do. Timothy Carey playing psycho-crazy on film. Chain of Evidence should have stayed with Tim, just as the earlier film should have stayed with Beverly, as a menacing bad-guy haunting a good-guy ex-con just out of jail. Tim has been waiting for the ex-con’s release, waiting for this guy who scarred his face before being sent to jail. You don’t pull on Superman’s cape. You don’t pull the mask off the old Lone Ranger. And you sure don’t scar Timothy Carey’s face. Carey is a convincingly malevolent force without a scar. It’s looking into Tim’s eyes, and seeing the burning barely contained molten madness ready to gush scaldingly into physical, almost demonic physical damage. Carey is cast in the type of deranged character in many film noirs in the early ’50s. Some commentaries on those films imply it might not have been all acting. Timothy Carey appears in the pilot episode of Baretta: “He’ll Never See Daylight”. I believe it was the first time I had ever seen him on film. He really seemed like the real deal of psychotic seething. 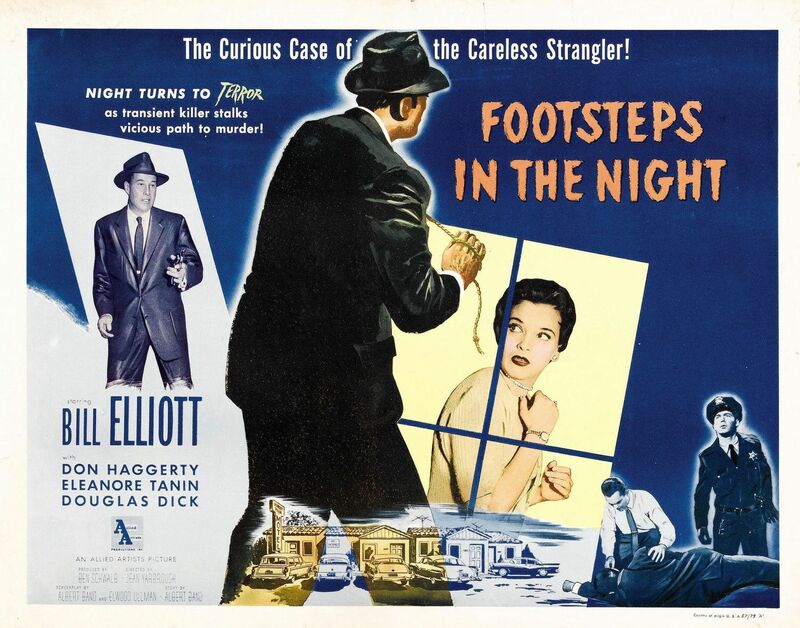 Footsteps in the Night in the last film in the series. Another poor schnook is on the run from a murder he swears he did not commit. This time an old man is garroted in his hotel room. Bill gets to shoot his gun at the end of the film, as lots of legs stalk through the night time sidewalks, and shadows hide the identity of the sharp-wired murderer. 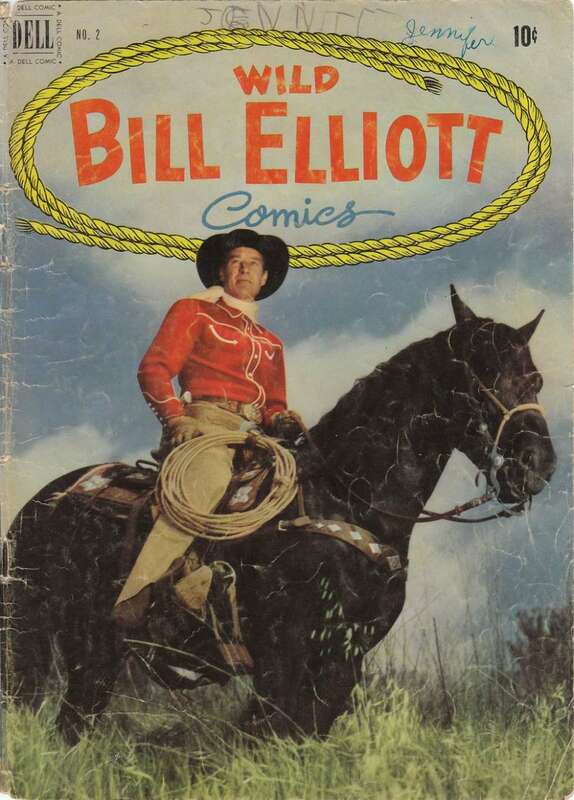 Bill may not wear his gun holstered backwards on his hips, and he may be shooting at bad guys in cars rather than on horseback, but this would be the last film he made, before giving acting up and going back to ranching. These films were hard to find until now. They are not the films Bill Elliott will be remembered for. They are not the films that gave him his own comic book series. In these modest police procedurals, Bill doesn’t get to act wild, or claim he’s a peaceable man. Other people get to act wild. Bill gets to arrest them. Bill will be recalled by some movie and comics buffs as one of the film personifications of Fred Harmon’s Red Ryder films. Below, Bill steps out of the pages of a Red Ryder book with George “Gabby” Hayes and Robert Blake as Little Beaver. I always loved that image of the characters stepping out of the book, Bill with his backward guns drawn and firing, blasting of the comic pages into the screen. But I’m glad the last films he made aren’t lost. The newly designed http://www.donmcgregor.com is up and running, and Gary and Dawn Guzzo have brought it up to date. I’m talking to Gary recently about having an update Blog right there on that very page where I can Post and you can reply. Check us out!